As we near the end of this first run, 41 shows in just two months has definitely taken it’s toll on the Brotherhood crew, but although exhausted, we’ve had the best time and everyone is pumped for things to come. Two more shows after tonight, then we take a much needed three-week break before the summertime fun begins. More touring, some major festivals and fantastic venues. Hell yes! 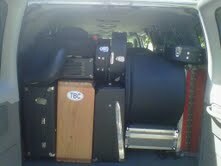 yes, this is our entire stage setup in the back of the van and along with six men, it's a tight fit. funny enough, at the end of the night, yours truly is literally the only member of the band who remembers where everything goes. leave it to us drummers, the master's of tetris!